The brighter weather makes us sit up and take notice of our homes in more detail. The longer days and lighter nights also give us more opportunity to get long awaiting DIY jobs done too. It’s not a great idea to let your home get into disrepair, and it’s really important to stay on top of all those little jobs before they become great big huge jobs. So with that in mind I thought I’d put together a little roundup of all those chores or mini makeovers that you can do that add value to your home or bring in that extra little bit of style. These ideas aren’t meant to cost a lot, and many of them can be done in a few hours or maximum, over a weekend, but if you do want to look at the bigger, more expensive ways to add value to your home check out my post here. 1. If you already have a driveway next to a garden, pave over the grass to create extra space for another car. Essential for families with multiple cars. 2. Update your front door with a fresh lick of paint, new doorknob and numbers. First impressions make a huge difference to a potential buyer. For more ideas on updating your front entrance check out my earlier post. 3. Have your house repainted, replace old guttering and fascia boards, and fix any holes in the roof. A new buyer can see these as deal breakers but a little money and time invested in these jobs will be beneficial. 4. Replace old and tired fencing. A broken down boundary won’t be appealing and will cost much less than the value it will add. 5. Remove any trees that are too close to the actual property (if they’re on your land of course) as structurally roots could be affecting the foundations of your home. 6. Ensure your garden suits your home. For example if you’re a family in a 3 bed semi, ensure your garden has grass for children to play on, and safe plants and trees. It’s always a good idea to include an adult seating area, to show how the garden can be a place to relax as well as play. 7. Update your windows. I know this isn’t the cheapest of makeovers but sometimes it’s essential to the overall value of your home. Do it in stages if the overall cost is too large. 8. Update your central heating and modernise your boiler. Again not the cheapest of jobs but it can put people off buying your home if your boiler went out with the ark! And think about those reduced energy bills too. 9. Ensure your bathroom looks modern, clean and well looked after. Declutter anything personal, update tiles, taps and flooring and add new towels and accessories. This is a much less expensive way of updating the room, without spending a fortune on a new suite. Lots more tips on updating your bathroom here. 10. Make your home look as spacious as possible which means clearing away clutter and creating light and space wherever you can. There are lots of tips on creating an illusion of space you can use, but the easiest one is to hang a mirror opposite a window to bounce light around the room. 11. Update your kitchen and modernise it in the best way you can. I’m not saying you need to go and buy a brand new kitchen, but ensure it’s all in good working order, change the cupboard fronts, worktops or handles if they need it. Freshen the paint and update the blind. Kitchens are so important now when it comes to the value of your home that this is one area you should focus on. 12. Add as much clever storage as you can throughout the house. It won’t cost much and will benefit you whilst you’re there and potential buyers will love the clear, uncluttered feel of your home. 13. Find reliable builders and workmen through friends, or even ask skilled friends to help you if you need it. If you’re lucky enough to have a skills exchange in your area then do use them to keep the cost of these DIY jobs to a minimum. 14. Don’t do a botch DIY job. It won’t help you or the value of your home. If you’re not sure how to do something, or simply don’t have enough time to do it, then pay someone or exchange skills. Buyers will see it straight away and it really won’t add any value to your home. 15. Don’t overvalue your home against the rest of your street. We’re discussing smaller DIY jobs here but even here you could take the value of your house over the limit for your street. If you do this, you won’t get a return on the money you’ve invested when you come to sell your house. If you are using any of these ideas, or indeed tips from previous posts and looking to add value to your home, do ensure you are properly insured. Companies like John Lewis have some great deals on Home Insurance and you know you’ll be getting a decent, honest service with them too. Of course shop around and find the policy that suits you best. 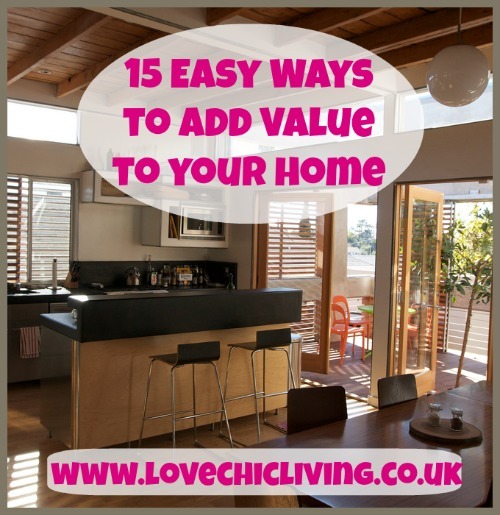 So, there we have my 15 easy ways to add some extra value to your home. And in putting some of these ideas into practice you’ll be maintaining your home too, so even if you aren’t thinking of selling just yet, your home will be in tip top condition for you to enjoy. This is such a great post to read.It is easy to read and understand.The 15 ways you have explain above i do agree with all of them thanks for sharing such a wonderful list with us.I will style my house same as above you explain.It is sharable article and easy to gain good points.Thanks to you for this article.